Hundreds of Hancock County residents and those from afar gathered just south of the new Highway 336 interchange outside of Carthage to witness the groundbreaking of the new facility that will replace the current site of Memorial Hospital. CEO Ada Blair, Mayor Jim Nightingale, and Memorial Hospital Board President Matt Dickinson headlined the speaking portion of the ceremony, accompanied by remarks from Capital Campaign Chair John Dittmer and Employee Campaign Chair Dina Schaller. Illinois State Senator John Sullivan and Representatives Rich Myers and Phil Hare sent along congratulations and tidings of good fortune to the hospital in their absence, two were in session and one was on vacation during the event. The current location of Memorial Hospital was named to honor veterans of World War II and was built shortly thereafter. The hospital gradually grew over the past 60 years to facilitate services that include 24-hour emergency room services, diagnostic imaging, surgical services, hospice care, cardiopulmonary services, physical therapy, neurology, and much more. Memorial Hospital's new building will offer all current services, as well as continue to forge ahead and take a progressive approach to health care and meet the needs of their patients as they arise. Many reasons accompany the recent decision to construct a new facility, most notably the fact that the upkeep of such an old structure would be much less cost-effective than building a brand new, state of the art facility capable of even more than the hospital currently offers. Figures show that correcting Memorial Hospital's current issues would cost between $10-12 million over the next three years, along with continually having to deal with other issues that are likely to spring up as the already aged building continues to deteriorate. Ada Blair, CEO of Memorial Hospital, said, "We are growing rapidly in terms of number of patients served. It was determined that the construction of a new, more efficient building would be more beneficial than the renovation of a 60 year-old building." Projections and estimations for the cost of installing the new facility is right around $22 million. Once the move of Memorial Hospital is complete, this will separate the nursing home from it's campus, which is a very good thing in terms of revenue being generated each year as a whole. Upon segregating the nursing home and hospital, the Medicare reimbursement Memorial Hospital would receive could increase by nearly $300,000 per year as the penalty they currently have had levied against them for that reason would be absolved. As the hospital is a not-for-profit organization and doesn't receive any funding from city or county taxes, the money for the endeavor has been raised as a part of the Capital Campaign, as well as from loans which will be paid back from the extra $300,000 that Memorial Hospital will receive from Medicare reimbursements. The project is slated to be completed in the Spring of 2009. 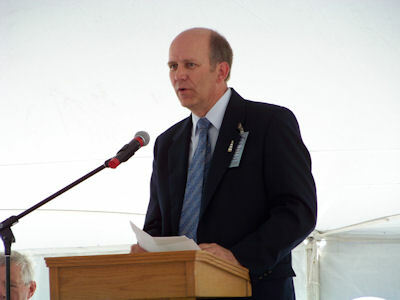 Memorial Hospital Board President Matt Dickinson addresses those in attendance before the groundbreaking.